Welcome to our series, Common Scents! Common Scents is a series of articles exploring the history of commonly used essential oils and how they became popular in modern day soap and cosmetic crafting. This month, we’ll learn about citronella. Here in the great Northeast, we love our few beautiful summer months. What we really don’t love are the mosquitoes and other bitey little fun-suckers. As you can imagine, this means the smell of citronella permeates outdoor gatherings and camping trips. Let’s talk about where this pungent oil comes from, and find out a few other historical uses for it while we’re at it! 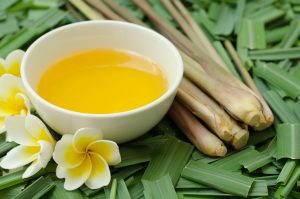 Citronella is obtained via steam distillation from a species of Cymbopogon, more commonly known as lemongrass. There are two chemotypes: Ceylon type and Java type. Opinions vary; some say that Ceylon is preferred, while others sing the praises of the java type. We’ll let you form your own opinion! The origins of citronella oil can be traced back to Sri Lanka. Currently, China and Indonesia top the worldwide production of citronella and provide a staggering 40% of the world’s supply. Following closely are Taiwan, Guatemala, Jamaica, South Africa, Madagascar, Sri Lanka, Honduras, India, Argentina and Mexico. Remember: this information is being provided strictly for educational purposes. The FDA has not approved citronella for medicinal use. The HSCG does not give medical advice and does not advise using or advertising citronella for medicinal purposes. Using citronella as an insect repellent has become more commonplace, but it is not always welcome. In 2006, the EU banned citronella as an active ingredient in any insect repellent due to concerns about safety. Those who make perfumes are still able to use citronella for their blends, but it cannot be marketed as a repellent or be used for that purpose. In 2012, Health Canada also banned the oil’s use as a repellent, but later lifted the ban in 2015. In the United States (as of the writing of this article), the EPA (Environmental Protection Agency) has determined that there is little to no threat to the environment when citronella is used as a topical insect repellent. Citronella is still very popular in soaps and cosmetics, and is a fantastic top note in fragrance blends when combined with similar citrus scents or deeps, woodsy smells-think cedarwood and bergamot. And let’s be honest-anything that keeps mosquitoes away is well worth the recognizable twang of citronella!